With the exception of their yellow eyes, you may not be able to see them because they blend in so well with the snow and dark twigs on the ground. But it would be hard to miss the low, powerful, rasping hoots of the Snowy Owl. The most famous is surely Hedwig from the Harry Potter movie series. 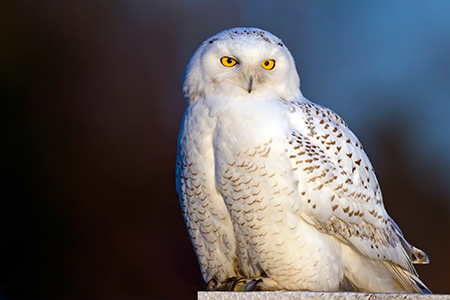 Males, like Hedwig, are solid white and become whiter with age, while females have black or brown markings mixed in on their white bodies and wings, which helps them to blend in with the snow and twigs on the ground where they make their nests. Snowy Owls have especially dense, thick feathers that cover their bodies, including their legs, insulating them from the frigid cold. The weight of their feathers makes them the heaviest of the North American owls. During the summer, Snowy Owls breed in the Arctic tundra—one of Earth’s coldest, harshest environments, in spite of the fact that it is daytime all day and “night” during the summer months. They migrate south for the winter—but it’s only “south” to them, not to most of us, as they migrate from the Arctic to Canada and the northern United States. 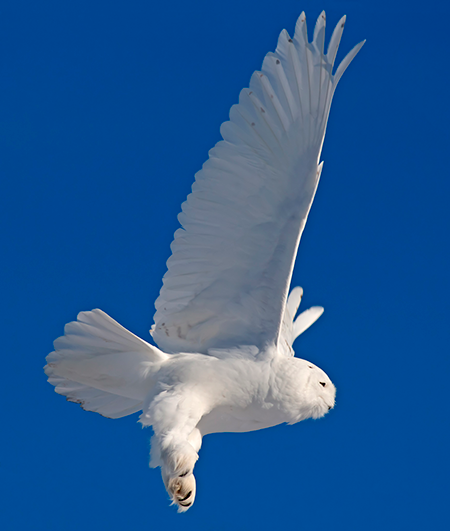 Snowy Owls are perfect for the Arctic. 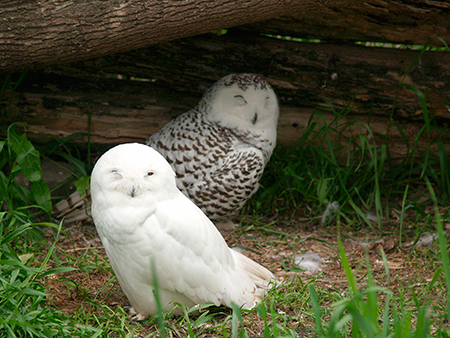 While most owls are nocturnal (they hunt at night), Snowy Owls are diurnal—they hunt during the day, which is handy during those extended daylight summer months. When hunting, Snowy Owls will stand still for hours, protected from the cold by their amazingly designed feathers, blending in with the snow, while they observe their surroundings with their efficiently designed eyes and ears. They are even able to “see” invisible prey, being able to hear animals that are moving under vegetation or snow. Their desired cuisines are rodents and small mammals like lemmings, which they can eat head first in a single gulp, although they are also uniquely agile enough to catch small birds on the fly for dinner. Snowy Owls routinely eat over 1,600 lemmings each year—more than four each day. Now, if someone wanted to design an animal that could live in the Arctic that could help regulate the lemming and rodent population, and occasionally be food for the gray wolves and foxes of the Arctic region, what would he come up with? The answer: the Snowy Owl—perfectly designed by God, the Chief Engineer.